Iranian politics isn’t my first idea of fun. 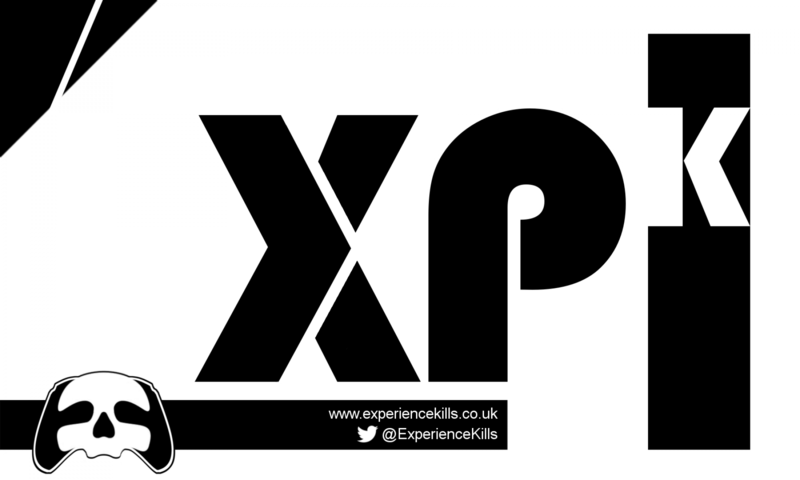 It’s not that videogames shouldn’t cover serious topics; if anything, too much of what we play is forgettable ephemera. Finding a meaningful theme or educational narrative can be a refreshing respite. I thought 1979 Revolution: Black Friday was going to be that kind of game. As an authentic exploration of the Iranian Revolution, it certainly has a cultural credibility. As a game in itself, one wishes it was a little more revolutionary. 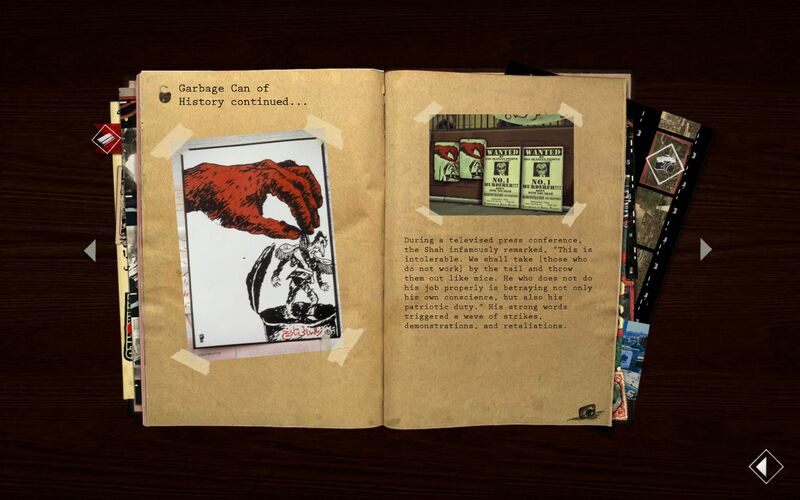 An interactive story in the mould of Telltale titles such as The Walking Dead, 1979 Revolution plays out through consequential dialogue choices, expository scenes and superficial scenery interactions (as you would expect from such a venture). In addition, those interactions unlock historical documents that compliment the accompanying scenes and events. 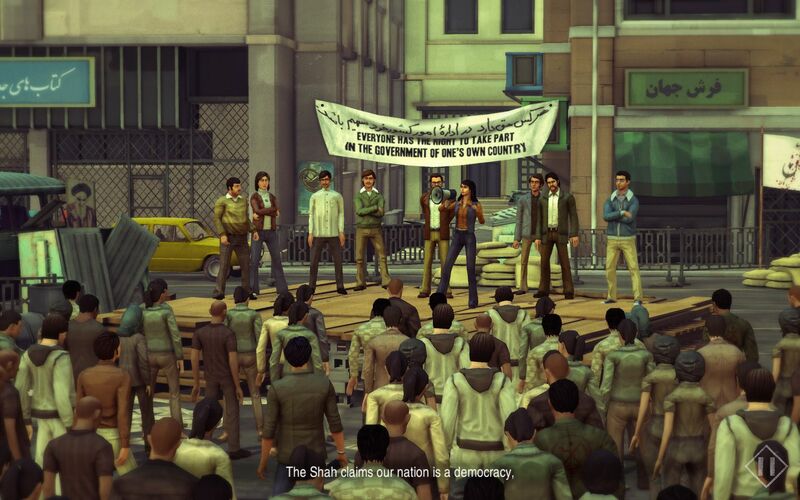 Playing as Reza Shirazi (an Iranian photo-journalist returning to his country), our protagonist’s journey naturally lends itself to the kind of forensic examination of Iranian society at the time of the Revolution. Player actions invariably focus on Reza finding photographic opportunities amongst Tehran’s milling crowds, before we get to read up on how it really happened. While these supporting documents speak to the grounded veracity of the project, they fit less neatly into the pacing of the experience. Granted, they can be minimised and read later, but the regular imposition of these amid gameplay does shift the focus uncomfortably from story-telling to lecturing. 1979 Revolution has a flavour of when “edutainment” (clumsy in name and nature) threatened to become acceptable in the lexicon. Such a problem is not ideal alongside gameplay that’s already uncomfortably stiff and elementary. Those familiar with Telltale Games’ output will recognise similar issues with engine performance and imprecise control. Whether or not this is tolerable depends on remaining engaged by the story; if that’s compelling enough, The Walking Dead proved that otherwise distracting technical problems can be ignored. For my experience of 1979 Revolution, this compulsion versus distraction dichotomy was weighted too heavily toward the latter. The scales tipped early upon realising that dialogue choices can be, without clear warning, a terminal moment in Reza’s story. Choose the wrong thing to say: Reza can die. Contextually this is appropriate; I imagine that Iranian state interrogations were less than forgiving of a sardonic tongue. But in gameplay terms? Disappointingly stultifying. Through Reza’s eyes, the opportunity to survey the Iranian landscape (literally and culturally) is in principle a tempting prospect. The dedication and passion of the development team to produce such a work is to be respected, and that side of 1979 Revolution is of undisputed value against a milieu of lesser ambition. The question that lingers is whether its lessons survive its interactive implementation. I’m sorry to say they come off worse for it. 1979 Revolution: Black Friday was provided to us by Nintendo/Digerati for Nintendo Switch. For more on 1979 Revolution: Black Friday make sure you tune in to BXB’s Bits and Bobs; our regular podcast available on iTunes.